If THIS doesn't describe the fun I had today at the NEW Kroger Marketplace, I don't know what does! I have to say, I was a little leery when I was asked to tour the new Kroger Marketplace located at the northwest corner of 23 Mile and Hayes in Shelby Township, MI today. I really did figure it was going to be just like Walmart. Well, it wasn't! It was wonderful. In fact, it put me in my happy place. You can ask Dale, the man who gave us the tour, how many times I said "No WAY!" There is so much to tell you about this "happy place!" I'll start with my very FAVORITE thing! These are photos of the Natural Foods department! Isle after isle of goodness! I mean, the sheer number of gluten-free products in these isles amazed me! "No WAY!" Yes, way! No longer will I have to HUNT for gluten-free products because Kroger makes it easy! Check out their labeling! Oh, and you'll notice all Michigan Made Products are labeled well as well! Ok, so they have a GIGANTIC produce department with the biggest offering of Organic produce I've ever seen! And tons of other produce....including the coolest thing I've ever seen in a grocery store! This is rhubarb, GROWING inside a planter at the Kroger Marketplace! How cool is that?!!! They have a Starbucks inside with a seating area, a Sushi kiosk where fresh Sushi is being made and Giant beautiful floral department. Murray's Cheese Shop was one of my other favorite stops we made. Customers can choose from over 200 different cheeses! Don't be afraid to try before you buy! Samples are always available to you, so don't feel intimidated to ask! Of course, they have a giant deli, bakery and meat counters! That's a bread slicer!!! You choose the thickness! As I moved through the store, I could see how vast each department was! Their housewares department even has appliances and kitchen tables for sale! Don't worry, you're not seeing things....and yes, you're still in Kroger! Kroger Marketplace carries clothing, shoes, jewelry, accessories, etc! Great prices too! They even have a baby section where you can get anything you need for baby! 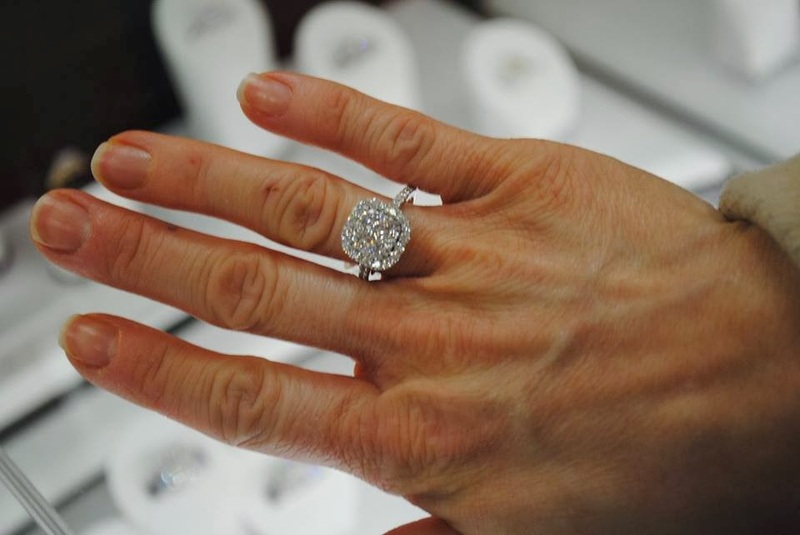 While you're shopping be sure to stop in and get your ring cleaned at Fred Meyer Jewelers. They have a BEAUTIFUL selection of jewelry and have everything from watch batteries, to GIANT Diamond rings!!!! Thank you to Becky of www.week99er.com for snaping this pic for me! Kroger Marketplace also has a office supply section, toy section, and a HUGE wine, beer and liquor section with someone to help you select the perfect alcoholic beverage to go with whatever you're serving! And how many times have you gotten through the whole grocery store, are in line and then remember "Crud! I forgot the milk!" Don't worry, you don't have to trudge to the back of the store! Kroger has an end cap of milk waiting for you! The Grand Opening of the Kroger Marketplace Shelby Township store is February 23, 2014 at 7:00 a.m. Check out Bargains To Bounty for all of the deals going on this week! I promise you, you won't want to miss out! For a full schedule of Grand Opening Events, check out www.week99er.com's post! *Disclosure: Kroger invited some bloggers, including myself, to tour and review the new Kroger Marketplace. I was provided with a Kroger gift card and a swag bag from both Fred Meyer Jewelers and Murray’s Cheese as thanks for my post and participation.